Water into Wine at Cana, Ivory Carving, 400's A.D. Faith Central, New Zealand. Marriage at Cana, Giotto di Bondone, 1304-06. The Marriage at Cana, Unknown English Master, 1310. Web Gallery of Art. The Wedding at Cana, Duccio di Buoninsegna, 1308-1311. CGFA. Marriage at Cana, Giusto de' Menabuoi, 1376-78. Web Gallery of Art. The Marriage at Cana, German, 1400. National Gallery of Art. The Marriage at Cana, High Decani frescoes, 14th century. The Marriage Feast at Cana, Hieronymous Bosch c.1485. CGFA. The Marriage Feast at Cana, Juan de Flandes, 1500. Web Gallery of Art. The Marriage at Cana, Gerard David, c 1500. Web Gallery of Art. The Marriage at Cana, Jan Vermeyen, 1530. Rijksmuseum. The Marriage at Cana, Garofalo, 1531. State Hermitage Museum. The Marriage at Cana, Paolo Veronese, 1560. Web Gallery of Art. The Marriage at Cana, Paolo Veronese, 1562/63. Web Gallery of Art. Marriage at Cana, Tintoretto, c. 1575. The Marriage at Cana, Marten de Vos, 1596-97. The Marriage at Cana, Johann Heinrich Schonfeld, 17th century. State Hermitage Museum. Jesus Changes Water into Wine, Matthaeus Merian the Elder, 1625-30. Biblical Art on the WWW. The Marriage at Cana, Mattia Preti, 1655-60. National Gallery, London. The Marriage Feast at Cana, Jan Steen, 1655/70. Olga's Gallery. The Marriage at Cana, Juan de Valdés Leal, 1660. The Wedding at Cana, Julius Schnorr von Carolsfeld, 1851-60. World Mission Collection, Wisconsin Lutheran Seminary. The Wedding at Cana, Gustav Dore, 1865. Felix Just's "Gospel of John" site. Turning Water into Wine, Carl Bloch, 1875, Hope Gallery. The Engaged Couple at Cana, James Tissot, 1886-96. Biblical Art on the WWW. The Wedding at Cana, James Tissot, 1886-96. Biblical Art on the WWW. Les noces de Cana, Louis Kahan, 1949. L'art religieux australien. Wedding Feast, John August Swanson, 1996 Serigraph. Water Made Wine, Ian Pollock, 2000. EICH Gallery. Les noces de Cana, Corinne Vonaesch, 2001. The Marriage in Cana, Hari Santosa, 2001. Asian Christian Art Association. Caana Wedding, Laura James, Contemporary. Water to Wine - Lana Turner, "Hymn to Her," collage by Karen Whitehill, contemporary. At Cana Jesus Turns Water into Wine, Vie de Jesus Mafe, North Camaroon, Africa. Hospitality Art Exhibit, St Anthony Shrine, The Worker's Chapel, Boston MA. The Wedding at Cana, Esperanza Guevara, from The Gospel in Art by the Peasants of Solentiname. Hospitality Art Exhibit, St Anthony Shrine, The Worker's Chapel, Boston MA. Wedding at Cana, African Mafa. Wedding at Cana, He Qi, China. Water into Wine Window, Statesboro First United Methodist Church, Statesboro, GA. Wedding at Cana, Lu Lan, contemporary. 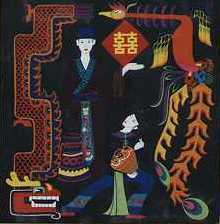 Lu Lan's Paintings.